Indefinitely, CT is going to get rocked tomorrow with our first massive snow storm this year. I actually love the big storms but I’d be way more pumped if my husband didn’t remind me first thing this morning that I’ll have to learn how to set up the generator – just in case the power goes out. I sure wish we had gone through with getting it hard wired, maybe in the next house?! Keiko and I will plan to hold down the fort since he more than likely will be held over at the end of his shift… and by that I mean I will drink (a lot of) wine and snuggle her until he gets in the door. Cheers to hoping and praying I don’t have to battle with the stinking generator! With our house currently on the market, we’re exploring a few avenues for the next one. Tonight we meet with a “green” builder after attending one of their seminar’s last weekend. We both walked away from it incredibly impressed and confident in the kind of work that they do. With that said, they absolutely got our attention. So I made a pork bolognese in preparation, using some of the ground meat from the locally raised pig I brought home Friday! Now I know a traditional bolognese is made with very specific ingredients (beef for one) and there are people out there who will fight over the topic, regardless this dish is downright knock-your-socks-off GOOD. 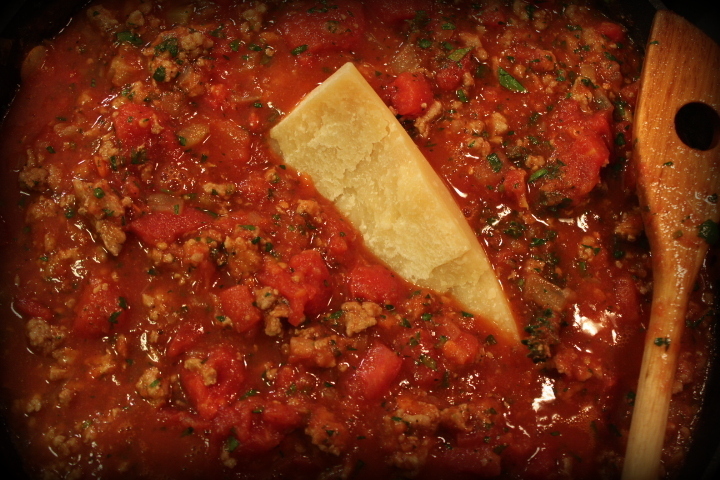 I’ve been making Giada’s Bolognese recipe for years, sworn by it and loved it as a house favorite so I used hers as the bones for my take on it here. Sidenote: Crossing my fingers for an abundance of space and light in my next kitchen, I really don’t want to bring in artificial lighting but I will if I have to. Until then, bear with me please – It’s a challenge when I photograph at night. Remember these – remove the little jerks. 1 parmesan rind – my grocery store sells these by the bag which is handy! 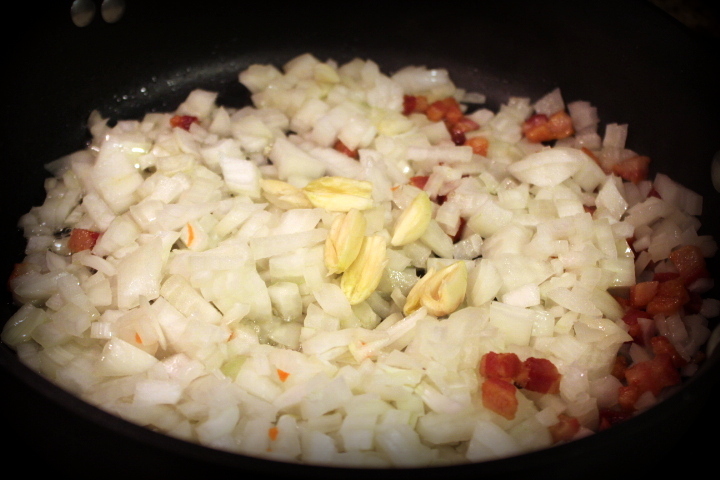 I like to use a wide and deep pan with a lid, it allows me to soften the vegetables faster and spread out the meat. Whatever you choose, preheat it to Medium with EVOO. 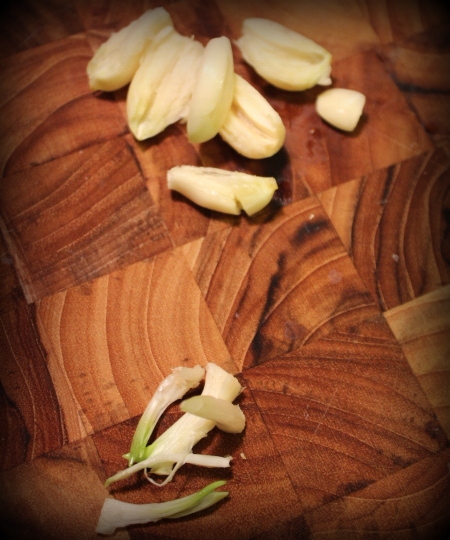 Good luck not plucking a few pieces from the pan. 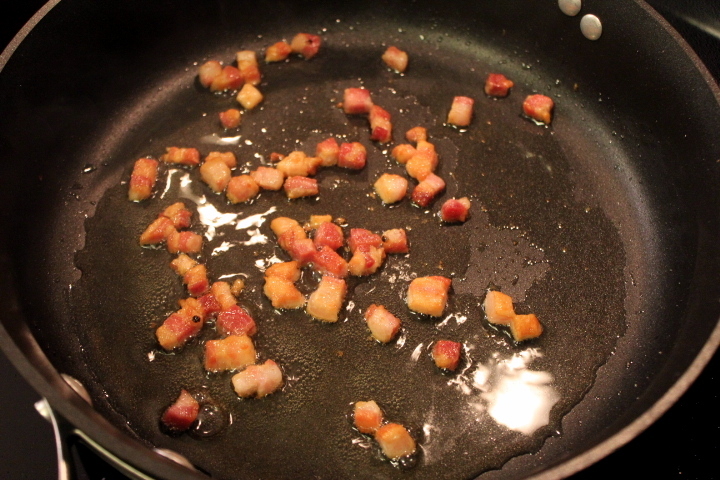 Brown the pancetta on both sides, ignore the ugly overhead oven light reflection por favore. It’s about to get fragrant my friends. 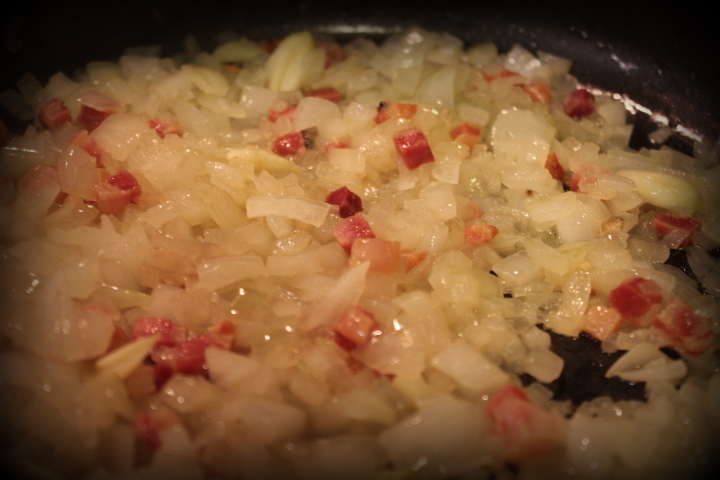 Let these soften, stir occasionally. 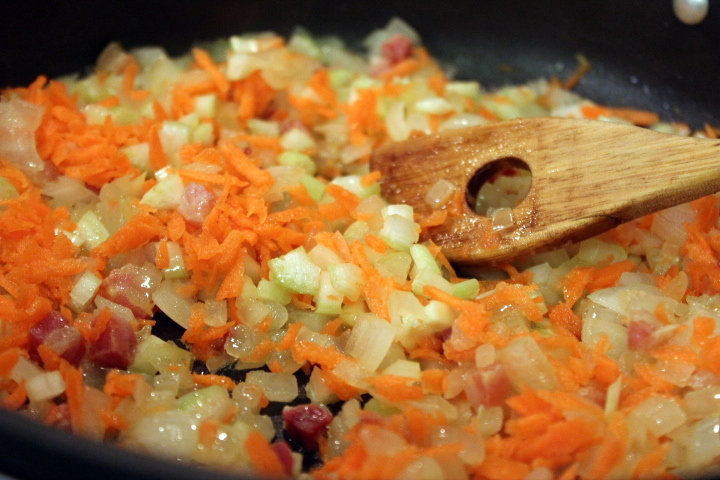 and let these soften too – just a few minutes depending on how you did your carrots and what size pan you chose. 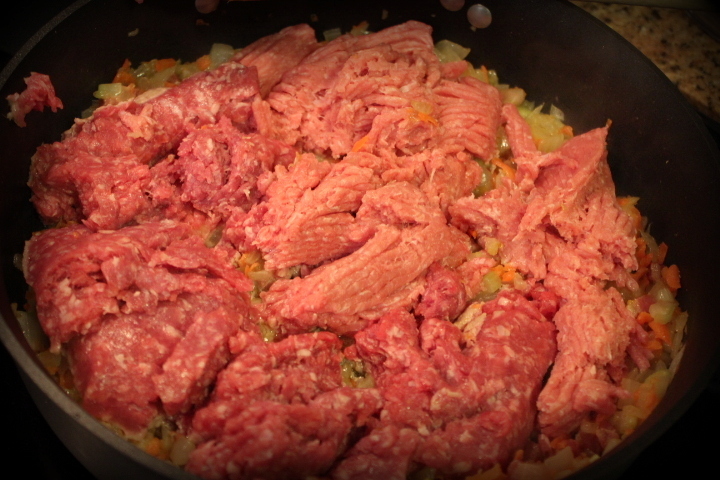 Once it is browned on all sides, add your tomato paste and coat the meat. continue to break the meat up to a nice texture. Add your wine and reduce by 3/4’s, sorry no picture. 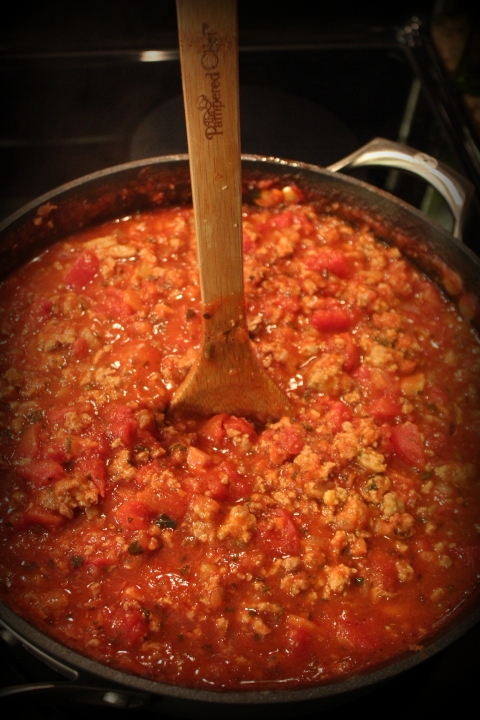 Finally, add your tomatoes, herbs, spice, and parmesan rind to the pan and let simmer for an hour or until thick. The secret ingredient – trust me. I chose to serve over creamy polenta but you can opt for tagliatelle or your favorite spaghetti. Top with freshly grated pecorino or whatever salty hard cheese you have on hand. 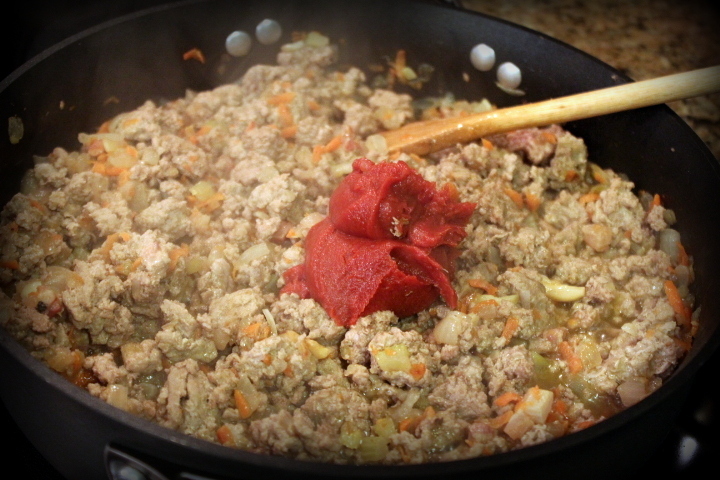 Pork Bolognese for your face – wowza! Personally, I buy Bob’s Red Mill brand Polenta and follow the directions on the back adding 1 cup of whole milk (or half & half or cream) when it’s done. The trick is to measure out your polenta into a bowl and gently shake very small increments into the boiling water while quickly whisking away. This takes a couple of minutes but that is the way it has to be done – sorry. 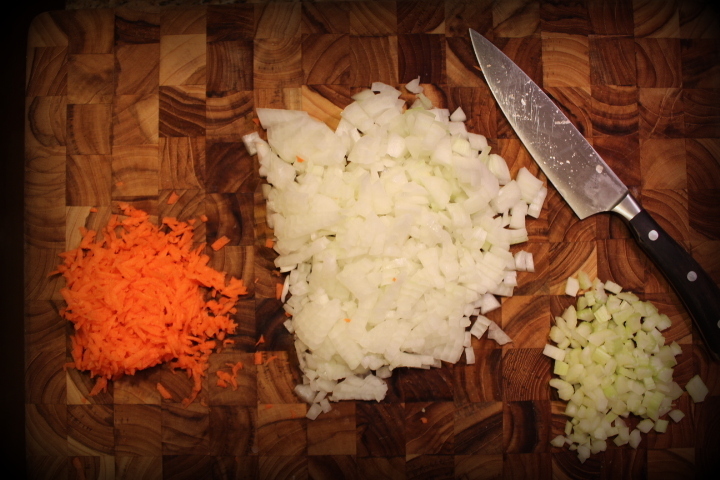 Lower your heat and let it gently finish cooking, stir with a wooden spoon every few minutes to keep it smooth. 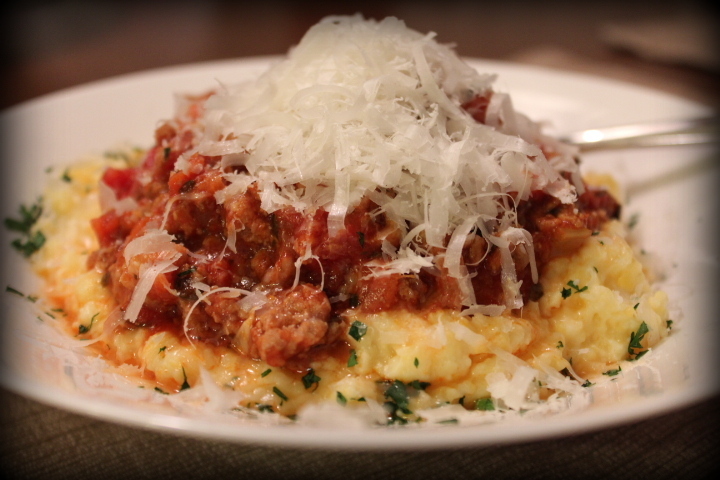 Polenta hates to be rushed so make this while the sauce simmers. If you’re looking for something to make ahead in preparation of the white death headed our way, give this one a go around and let me know what you think! 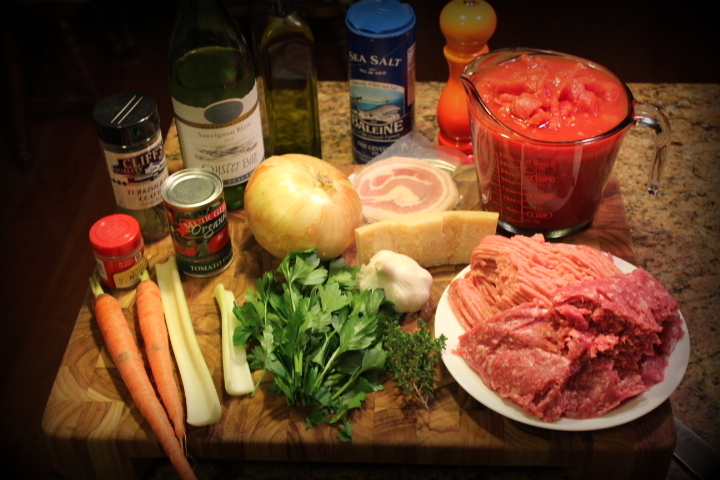 This entry was posted in Sunday Dinner and tagged Bolognese, Gluten Free, make ahead, pasture raised, Polenta, Pork, recipe on February 7, 2013 by NewEnglandGirl.